The U.S. Consulate General Chiang Mai joined Doi Pui village and Suthep Tambon Municipality for the village’s “Big Cleaning Day.” U.S. Consul General Susan Stevenson and 30 members of the Consulate community worked alongside approximately one hundred Doi Pui residents, joined by 30 Suthep Thambon Municipality staff and Payap University students to pick up litter in the village and surrounding forest and organize it for reuse and recycling. The U.S. Consulate’s participation in the Doi Pui “Big Cleaning Day” helps mark the April 22 Earth Day and the United Nations’ 2011 “International Year of Forests.” The Chiang Mai Municipality supported the Consulate’s Earth Day activity by donating a toxic waste bin to Doi Pui Village. 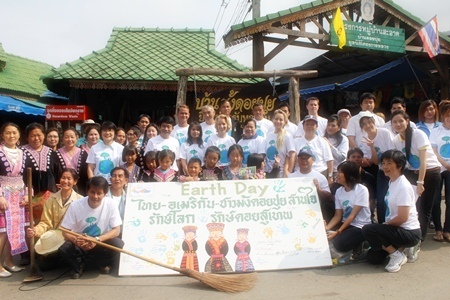 Additionally, Pepsi-Cola (Thai) Trading and Frito-Lay plant in Lamphun provided financial support on Earth Day T-shirts. Robinson Chiang Mai joined the nation in celebrating a traditional Songkran, Thai New Year with a Rod Nam Dam Hua ceremony for Chiang Mai Governor ML Panadda Diskul. 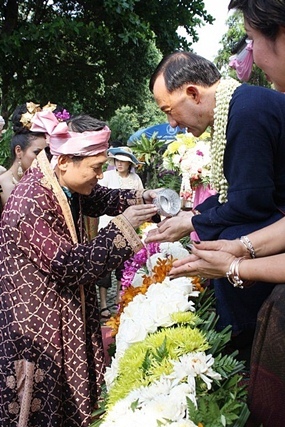 On April 15, Suriya Tancharoen, General Manger of Robinson Chiang Mai led the Robinson staff in a beautifully decorated Traditional Lanna parade and then they paid respects to the Governor and his wife. The parade included the Miss Songkran dancing with offerings as a tribute to the governor of Chiang Mai. This Rod Nam Dam Hua ceremony is held annually. Welcoming visitors to Chiang Mai’s Thai Traditional New Year festival during April 10-12, Orachorn Chanwiwattana , 4th from left, Acting Region 5 Director and General Manager of Central Airport Plaza shopping center, Chiang Mai, Pornthep Arthakitchpaisal, Manager of Sales Promotion department, and Nok Air staff presented the first 10,000 coupons for free Kao Soy noodles as souvenirs to tourists and visitors who were on board the arriving Nok Air flight at Chiang Mai International Airport. Dr. Chao Duangduen na Chiengmai, center, chairperson of the Chiang Mai Provincial Cultural Council graciously presented a gold necklace to Phetcharee Kaekkueng, a visitor from Chaiyaphum province, who was one of the 22 lucky draws so far, and who paid for products and service for 250 bath up at the Chiang Mai Night Safari. This year, the lucky draw from raffle tickets held every Friday and Saturday. Picture here, Naruemol Plawat, Chiang Mai Deputy Governor is seen drawing the winning raffle ticket while Dr. Sarawuth Srisakun, CEO of the Chiang Mai Night Safari, watched. 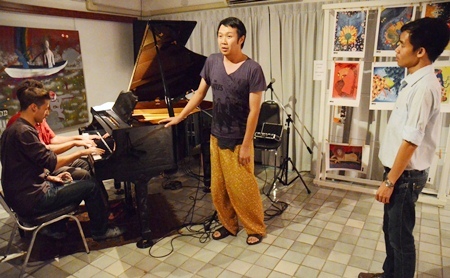 The lucky draw took place on April 16, on the occasion of the night zoo’s 5th anniversary. 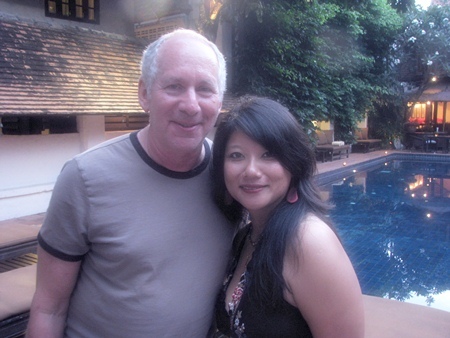 Paul Fihn and Mrinalini Rai attend a charity fund raiser at the Tamarind Village. The evening featured live music and cocktails as well as a silent auction. Mae Hong Son residents attended the “Rod Nam Dam Hua” ceremony for the Deputy Minister of the Interior. The provincial authorities, Kamnan and village headmen in Mae Hong Son hosted the ceremony for Thavorn Senniem, the Deputy Minister of Interior on April 17 at the Hongson Sueksa School, where about 200 people also participated in the traditional blessing and forgiving ceremony. Chiang Mai Governor ML Panadda Diskul and Dr. Ken Santitham, permanent secretary of state for the Chiang Mai Municipality attended the Opening ceremony for water slot machine services to help support the Songkran water festival. 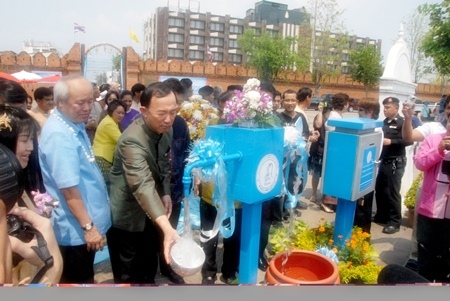 The water slot machines were set up at 20 points throughout the city and the water was supplied by the Chiang Mai Water Works from April 8 -15, 2011.